Fitbit is undoubtedly a useful gadget that keeps you updated on your health and fitness. However, its tracker comes with a fair problem that is raising many eyebrows. 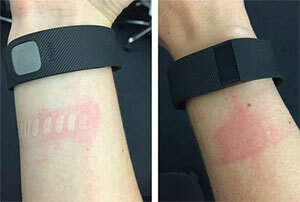 A number of Fitbit users have reported itching and skin rash caused due to Fitbit Charge’s wristband, and the number of reports is increasing. The consumer electronics company previously recalled its device Fitbit Force, after number of customers reported skin irritation. In November last year, the Force was replaced by the new Fitbit Charge containing a different textured wristband. Looks the company didn’t learn from its mistakes and the customers are still complaining about the product on social media and online discussion forums. Many users including a Yahoo tech columnist, Alyssa Bereznak have uploaded pictures showing their red swollen wrist. Fitbit on the other hand has clarified that the new trackers are safe, containing less nickel and no adhesives. In an attempt to explain further, they pleaded the rashes can happen with any tracker, including Garmin, Jawbone and Nike. It actually happens to those whose skins are allergic to nickel. In fact, the device comes with a small warning note that its use may cause skin irritation. Fitbit is not willing to disclose the lab results of its trackers, while the government says it has right to block trade secrets. Anyways, as many as 14 users are all set to jointly file a lawsuit against the company. Moreover, the Consumer Product Safety Commission may also investigate the complaints. In the meanwhile, users who feel a bit annoyed are advised to stop using the device until any further development.